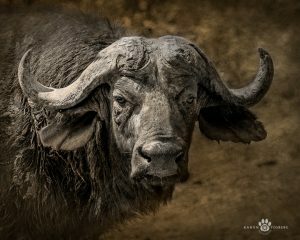 Let me show you how I created this Cape buffalo portrait. This is not what initially came out of my camera. Learn More about how I got from okay to beautiful. I have taken a number of photography classes that teach everything from posing, lighting, composition, and editing. I cut my teeth on a wedding photography class from an internationally recognized photographer. Not only did it cover how to photograph a wedding but also discussed the business aspects of a successful photography studio. Even though I personally do not specialize in shooting weddings, the course opened up the creative, technical, and business windows for me. This particular post will expose you to editing. I will show an editorial progression of a photograph I took of a cape buffalo while in Zambia. I strongly believe in continuing education and in discovering the endless editing possibilities. There is so much to learn and after spending the majority of my working days using the left side of my brain as a veterinarian, my right brain is enjoying the creative push. 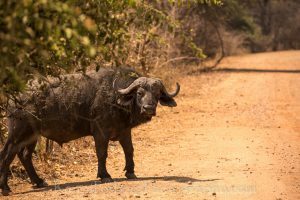 During our safari, we could see that a herd of buffalo was on the move and our park guide drove our vehicle to a road where he thought they may cross. We were able to get there just in time as they began to walk cross the open road. I was thrilled because the years before, we either did not see any buffalo or they were too far off in the distance. Being this close to the herd was on my safari wishlist. I think they are magnificent creatures to see in person so I wanted to capture a nice photograph of at least one of them. 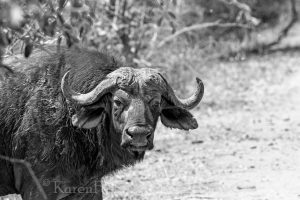 This bull was leading the herd and when he stepped onto the road and saw our vehicle he stopped for about 20 seconds, turned his head, and stared straight at us. This first photograph is straight out of camera, no cropping, no editing. I focused directly onto his eyes. My first stage of editing was cropping the photograph down to what I wanted to focus on. 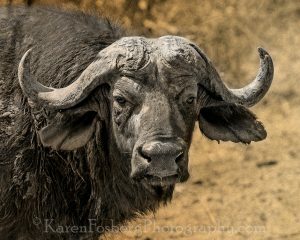 In this case, I wanted to showcase the buffalo’s head. Plus, I wanted to see what kind of detail of his face and horns I able to obtain. I was pleasantly surprised to see what the image was able to reveal. There are a few annoying branches running across his face and body. Fortunately, none of them were crossing his eyes. I removed them in Photoshop. I also brightened up the image more so you can see the detail of his hide better. I was not concerned that much of the background being too light because I am going to turn this into a black and white image. I increased the spread between the blacks and whites so the creases in his horns and face became more pronounced. Then I cropped the photo to the final size so the head is the main focus. The next step in the editing process was to add an aged gold texture then a leather texture on top of that. This put a golden hue back into the photo. I removed about 20% of the gold hue from the buffalo’s face in order to make it the brightest part of the photo. The background was still a little too bright so I added some black smoke around the buffalo. 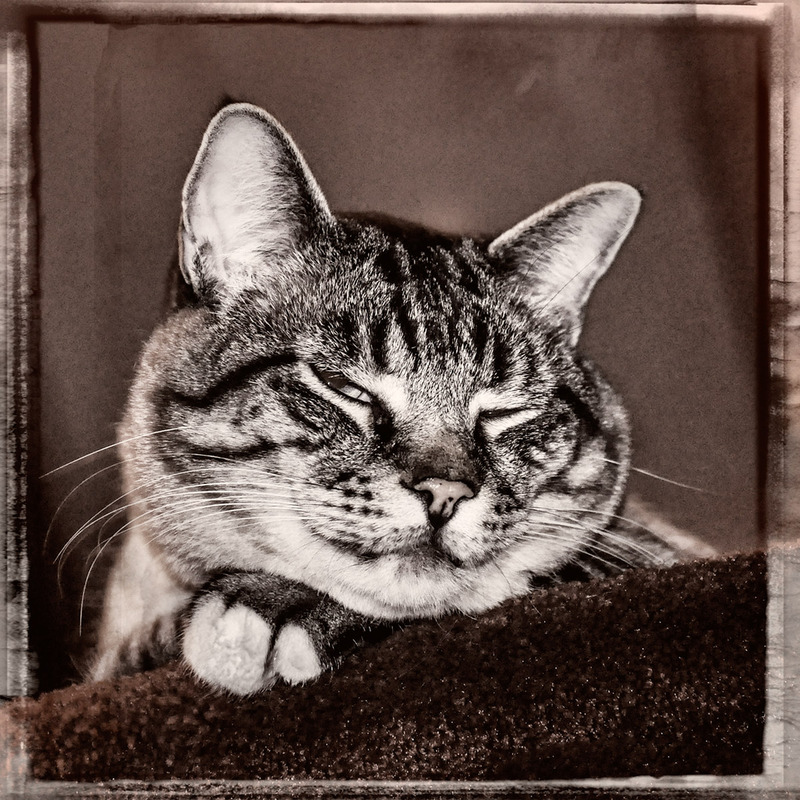 Then the final edit was to place a dark vignette (darkening or lightening the edges of a photo) on the edges to draw your eyes towards the center of the photograph. At this point, I am happy with the results and call this the end point, the final portrait. I hope you enjoyed my photographic editing journey. As you can see, fine art photography is much more than getting the initial shot. 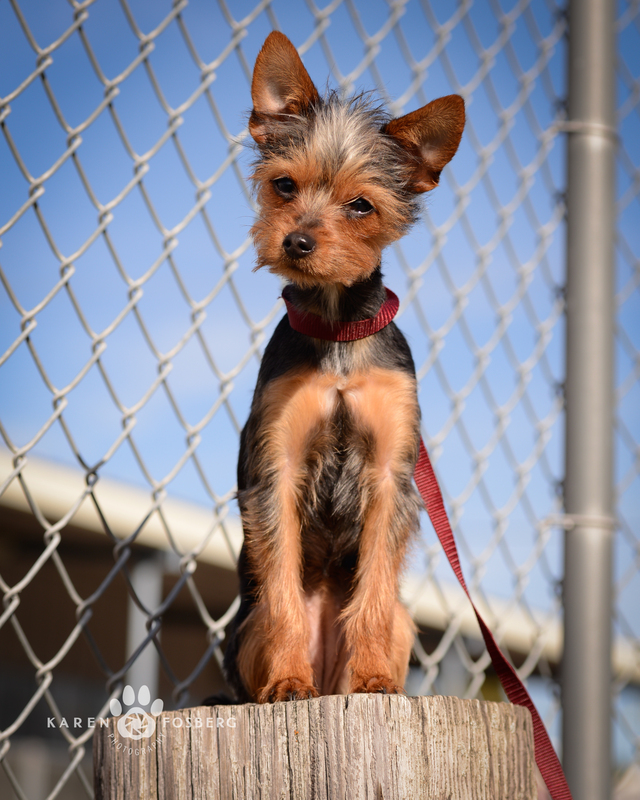 Knowing how to finesse a photograph can make an okay picture into a beautiful portrait. 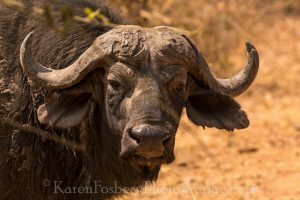 If you would like to schedule a photographic session with Karen Fosberg Photography, then mention the “Cape buffalo” and receive 20% your photographic session.  Call Karen at 509-828-0421 or email her at karen@karenfosbergphotography.com or use this Contact button to send an email.